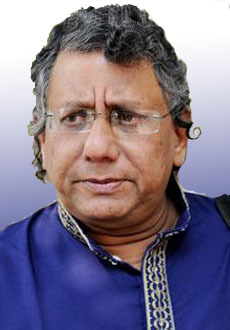 Tanvir Mokammel (born 1955) is a bengali filmmaker, author and a former communist activist from Bangladesh. He studied English literature film University of Dhaka and worked as a left-wing journalist for landless peasant in rural area. As a filmmaker he has made five full-length feature films and twelve documentaries of which some have received national and international awards. His movie "Nadir Naam Modhumati" (The River Named Modhumoti) and "Chitra Nodir Pare" (Quiet Flows the River Chitra) ranked second and third respectively in the list of 10 best Bangladeshi films, in the audience and critics' polls conducted by the British Film Institute. He is now the director of “Bangladesh Film Institute” and “Bangladesh Film Centre”. •	Hooliya (Wanted): An experimental film based on a political poem by poet Nirmalendu Goon. •	Smriti Ekattor (Remembrance of ’71): A documentary on the murder of the Bengalee intellectuals by the Islamic fundamentalists during the Bangladesh war of liberation in 1971. •	Ekti Golir Atyakahini (Tale of a Lane): An ethnographic documentary on the life and the present condition of the Hindu conch-shell makers living in the architecturally interesting ancient lane of Shakhari Bazar in Old Dhaka. •	Nadir Naam Modhumati (The River Named Modhumati): A deconstruction of the Hamlet theme on the backdrop of the Bangladesh liberation war of 1971. — Received three national awards for best story, best dialogue and best song. Shown in Tri-Continental Film Festival, Nantes, France. •	Swapnar School (A School for Swapna): A documentary film about the alternative schools for the poor adults in Bangladesh and on the prospect of their education. •	Chitra Nadir Pare (Quiet Flows The River Chitra): A feature film on the destiny of a Hindu family in East Pakistan who refused to migrate from their homeland after the partition of India in 1947. — Received seven national awards including the best film, best story, best script, best art direction and best director of the year. Shown in London, Oslo, Fribourg (Switzerland), Singapore, Delhi, Calcutta and Trivandrum film festivals. •	Images And Impressions: A documentary on the ideals of the Folk High Schools in Denmark. •	Lalsalu (A Tree Without Roots): A feature film based on the novel Lalsalu The story centres around the life of a Mullah who established a false shrine in a remote village in Bangladesh. — Received eight Bangladesh national awards including the best film, best script, best cinematography, best sound and best director. Jury's special mention, 1st International Film Festival, 2003, Dhaka and shown in London, Rotterdam, Montreal, Quebec, Cinenouvo (Belgium), Jeonju (South Korea), Fukuoka (Japan), Toronto (Bongo Festival) and Delhi International Film Festivals. •	Oie Jamuna (A Tale of the Jamuna River): A documentary, a journey- film on the Jamuna river. The filmmaker on a boat follows the mighty Jamuna all the way from where the Jamuna enters into Bangladesh to downstream where it confluences with the Padma, another major river of the Indian subcontinent. The film shows the condition of the Jamuna river and the people living beside it. •	Lalon: A feature film on Lalon Fakir, a mystic song-composer of the 19th century. Lalon, steeped in Sufi tradition, Hindu Vaisnabism and Buddhist Tantrism and was also a Guru among the Baul-Fakirs of Bengal. Lalon composed few hundred songs with profound depth and excellent sense of music. The film depicts the life and persona of Lalon Fakir using the lyrics of his songs. — Received national award for best Art Direction, 2008. Shown in Fukuoka (Japan), London, Cleveland, competitive section in Dhaka International and in the of Goa (India) international film festivals and in Musée Guimet, France. •	Karnaphulir Kanna (Teardrops Of Karnaphuli): A documentary on the plight of the Chakma, Marma, Tripura, Mrung and other indigenous people of the Chittagong Hill Tracts. •	Riders to the Sunderbans (Bonojatri): A journey-film, in which the filmmaker follows the odyssey of a group of fishermen's wives crossing the Sunderbans, the biggest mangrove jungle in the world. Through their journey, the film unfolds the present condition of the jungle and also the plight of the poor people living around it. •	Bostrobalikara: Garment Girls of Bangladesh: A a documentary on the female garment workers of Bangladesh depicting their lives, meagre wages, working condition and dreams. — Received the award for best documentary film of the year by Bangladesh Federation of Film Societies. Shown in Musée Guimet, France. •	Tajuddin Ahmad: An Unsung Hero (Nissonga Sarathi): A documentary about Tajuddin Ahmad, the first premier of Bangladesh, who in absence of Bangabandhu Sheikh Mujibur Rahman, successfully led the liberation war of Bangladesh in 1971. — Received the award of best foreign language documentary film by TVS community television channel, Australia. •	Swapnabhumi (The Promised Land): A documentary about the Urdu-speaking community of Bangladesh popularly known as the Biharis. — Received the award for second best documentary film by Film South Asia Film Festival, 2009, Nepal. •	Rabeya (The Sister): A deconstruction of Sophocles’s play “Antigone” on the backdrop of the Bangladesh liberation war of 1971. — Supported by Hubert Bals Fund and received grant as one of the best scripts from the Government of Bangladesh. •	1971: A mega-documentary on the liberation war of Bangladesh. •	The Japanese Wife: A a documentary on Hariprobha Takeda, the first Bengalee woman who wrote a travelogue on Japan and used to read Bengali news from Tokyo Radio for Subash Bose’s Azad Hind Fouz. •	“Film Aesthetics and Twelve Directors” (Chalachitra o Barojon Director) in Bengali, a book dealing with the film aesthetics of Griffith, Eisenstein, Kuleshov, Pudovkin, Cocteau, Dziga Vertov, Stroheim, John Ford, Renoir, Godard, Rene Clair and Satyajit Ray, Sahitya Prakashoni, 1985. •	“Film” (Chalachitra), a brief history of the world cinema, in Bengali, published by Bangla Academy, 1987. •	"Marxbad O Sahitya" (Marxism and Literature), a collection of essays, mostly literary criticism and on different authors of Bengali literature, also essays on Gramsci or on the problem of alienation. •	“Syed Waliullah, Sisyphus and Quest for Tradition in Novel” (in Bengali), a book of literary criticism on the novels and short stories written by Syed Waliullah, perhaps the most prominent writer among the Muslim community of Bengal, published by Muktodhara, 1988. •	“Nitchutalar Manush”, translation of Maxim Gorky’s play The Lower Depths, into Bengali, published by Viswasahitya Kendro, 1997. •	“Charlie Chaplin: Triumph of the Tramp” (Bhabaghurer Digbijoy), in Bengali, on the life and craft of Charlie Chaplin as an actor and filmmaker, Sahitya Prakasoni, 1996. •	“Grundtvig and Gonoshikhsa”, a book on the theories of alternative education for the downtrodden and disadvantaged people of the rural areas, 1997. •	“Art of Cinema” (Cinemar Shilparup), in Bengali, a collection of essays on different aspects of the aesthetics of cinema, published by Agami Prokashoni, 1998. He has also published articles on different socio-political issues, poems, short stories, book reviews, translation works, theatre and film criticism in different newspapers and journals.